Approximate Dimensions: 4.5" x 4.5" x 4.5"
AJ is one of the larger wooden Brain Teaser puzzles that we offer. Originally designed by Philippe Dubois. 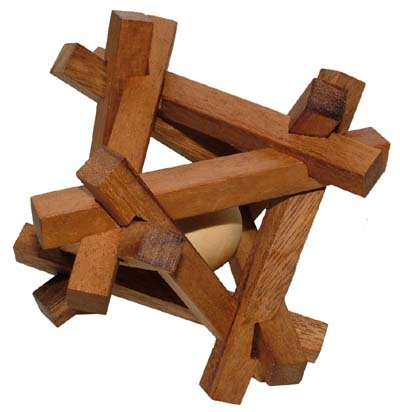 12 Pieces puzzle creating a cage that contains a wooden ball wooden ball. The twelve sticks form an octahedron shape. The AJ is a great interlocking burr and can displays very nicely as a desk accessory or coffee table puzzle! The challenge is to disassemble the 12 pieces to remove the ball from the structure. Then try to put it all back together again!